MN Bird Guide offers several guiding options for our clients from half-day to full- day and multiple days. Half days range from 4-6 hours of guiding including travel time, full days range from 6-10 hours of guiding including travel time. The number of hours during our tours are just a range, our tours can be flexible to fit your needs. Half and full day trips are great for Aitkin County and or making several stops in or around the Brainerd Lakes Area. To explore and bird the Sax-Zim bog we suggest 1-2 full days for the best experience and opportunity. Please contact MN Bird Guide - Judd Brink about private guiding rates for 1-2 people. 5-9 people $15.00 per person/per hour. starting at $10.00 per person/per hour. Available as requested on all of our guiding trips/birding tours is use of our Bird Watching Kits (4) that include binocualrs from our friends at Eagle Optics, a bird checklist, a field guide to Minnesota Birds all packed in our custom made packs! These are great for familes and friends who decide to join us. Happy Birding! 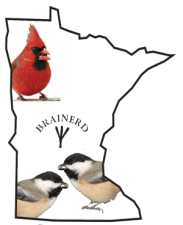 Please click on the image below to see our MN Bird Guide Birding Kits.